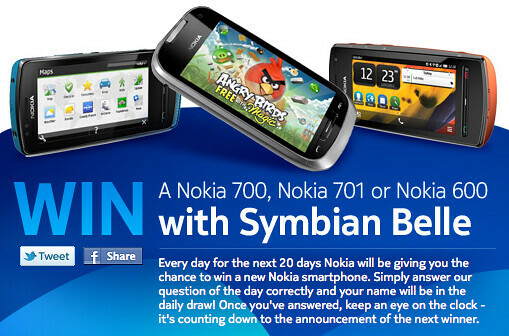 Stand A Chance To Win A Nokia Symbian Belle Phone – Nokia is having a contest right now where you can win the latest Symbian Belle powered phone, a Nokia 700, Nokia 701 or Nokia 600 by just answering a Nokia related question. There will be 19 units of phone to be given out for the next 19 days. All you have to do is just answer the question of the day at Nokia’s Facebook page and you will be in the draw for the Symbian Belle-powered phone. The question is pretty simple which you can actually Google on the Internet for it. Just try your luck and who knows, you might be lucky one who wins away one of the latest phone by Nokia. Just visit the Facebook page to know more and you are on your track for a new Nokia mobile phone.